Today was a maintenance day on the Beemer. I hadn't changed drive train fluids in a couple of years. 350ml in the final drive, 150 ml in the drive shaft housing and 800 ml in the transmission. All 90 weight. 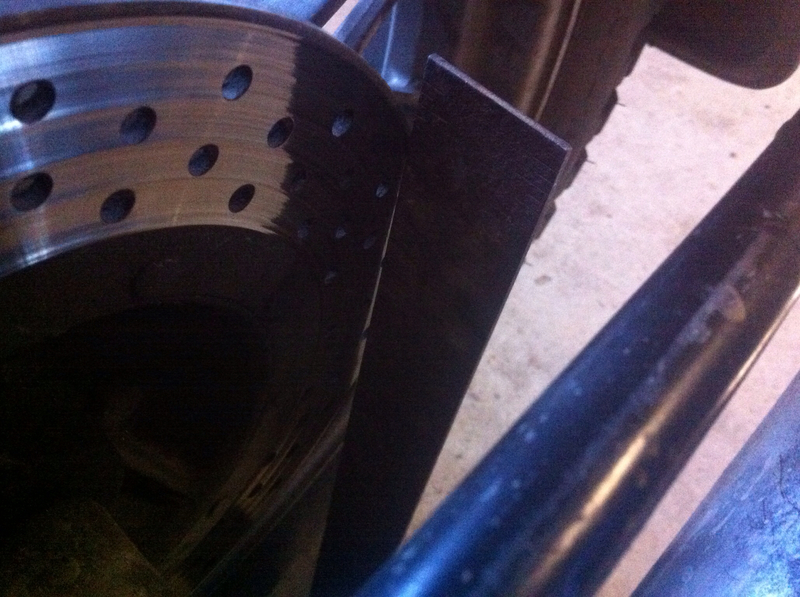 The drained oil was relatively clean with the exception of the drive shaft housing which had evidence of water. Two years ago, I had removed the driveshaft boot at the transmission to look at the U-joint and hadn't gotten the boot fully back in place for a couple of weeks. No evidence of metal on the magnetic drain plugs so, no problems. When we set the toe-in and lean a few days back, I used a magnetic clinometer on the rear brake rotor and we measured the angle that the bike was leaning away from the sidecar at 2°. While riding yesterday morning, it almost felt like I was tilted toward the sidecar. Yesterday afternoon, I checked the level of the garage floor and it wasn't level which threw off our measurement. Today, I put an "old school" steel carpenters square against the rotor and floor to check the lean. It was vertical or 0° lean. We adjusted the struts until there was a sliver showing between the square and the rotor guessing about a degree or two. Now when running down the road, it could be hands off the bars. Another huge improvement. It's wonderful to have someone so knowledgeable about sidecars around. I also figured that it was finally about time to remove the front studs. As you can see, they were pretty worn but lasted three times longer than the rear studs. Next year, I'm going to try the GripStuds with the tungston carbide core. They should be more durable. 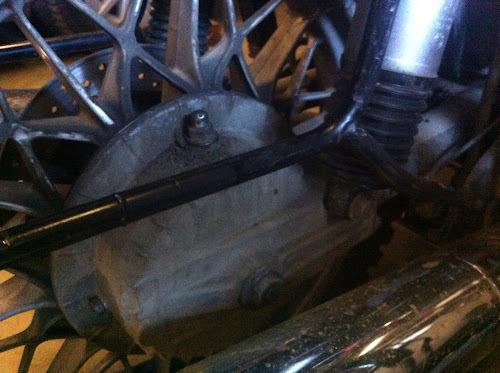 I also tried out Dom's tire chains for fit and the Beemer has even less clearance than the Ural between the rear tire and the driveshaft housing. If I wanted to use them I would need to find a 3.75x18 rear tire. Today, Dom is at Frozen Motorworks going through some testing procedures with Jon, the owner, on his Ural's fancy new ignition system. Jon thought that he had figured out the cause of the rough running and when we rode down (with Dom as the monkey again) his rig sounded as bad as ever. They both looked pretty frustrated. Intermittent electrical problems are a real challenge to solve. Tomorrow afternoon, another local Airhead wanted to stop by and look at my sidecar mounts. He as a R90/6 and the Cozy sidecar I took pictures of last Fall in George Rahn's shop area. The last time I talked to him he was planning on attaching it to his K75 but has since changed his mind. I think that either would make a great tug but he feels more comfortable with the /6 since it has a conventional frame. 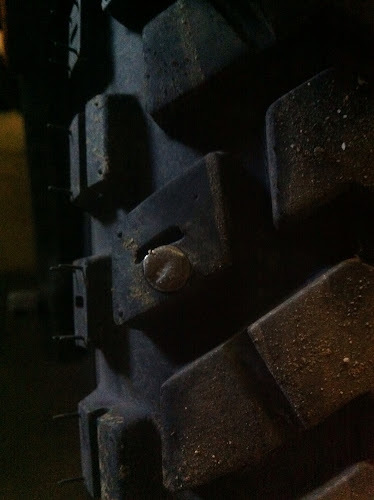 You removed the studs from your tires and I had the snow tires removed - spring must be coming to the continent! Maybe, there's hope. It was still felt pretty cold riding around today. Look at all the springtime activity! New fluids, no studs. Nice!! Almost, still have the winter oil in the engine. Only 3°F this morning. But it still feels like Spring!